If you're a regular reader of my blog you'll know how much I love a good glow. Highlighters, illuminators, oils - I'll take them all! The summer is the perfect time to rock a glow, even on the body. 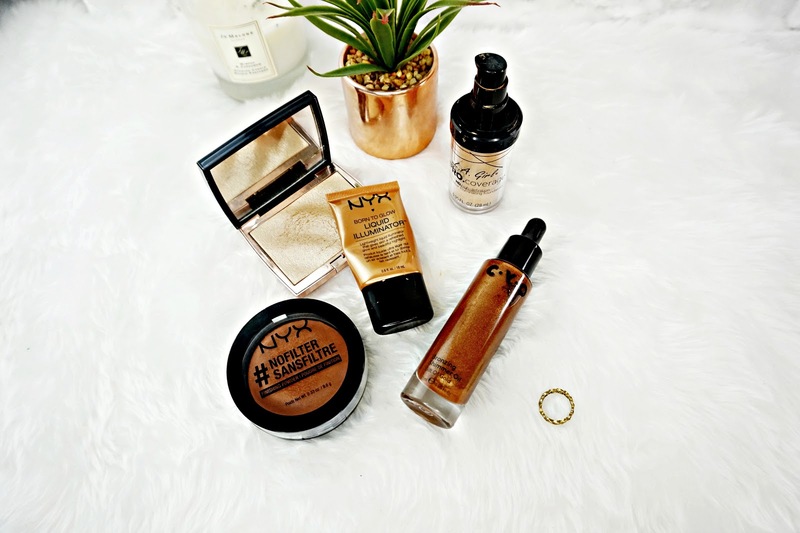 So today I wanted to share with you my favourite products for a summer glow. I have dehydrated skin so skin prep is such an important step for me. I also find primers a great way of adding glow to the skin, especially if you like satin or matte foundations. My favourite illuminating primer at the moment is the NYX Liquid Illuminator | £8 | Now this is a bit of a strange product (in a good way) because this is illuminating but it dries down, giving the skin a really smooth finish, but it still gives the skin a luminous look. I actually find this helps keep my makeup in place longer to. This does look a little tin man-ish when first applied to the skin, but with foundation over the top it looks beautiful. Really like the skin is lit from with in. For me a dewy foundation is important when going for a summer glow kind of look. But if you're on the more oily side you might want to opt for something more mattifying. My favourite dewy foundation ever has to be the LA Girl Pro coverage HD Foundation | £10 | It gives me the most incredible glowing skin. But not one that's over the top or turns super oily come lunch time. This also has amazing coverage, it pretty much covers everything I want it to, which I find really impressive for a dewy foundation. This also lasts all day on me too without any issues! It's the perfect summer foundation. No summer glow is complete without a sun-kissed, bronzed look to the skin. I've been loving the NYX No makeup Finishing Powder | £10 | Now this is a setting powder but I brought the shade Dark Deep to use as a bronzer and it works amazingly! Because it's not as pigmented as a regular bronzer it's really easy to build up, without going over the top. The finish is lovely, it has a satin finish that has a slight sheen to it. It layers perfectly with all my other base products to. It's finely milled formula means this never looks powderey or natural. It's a great bronzer. I love a highlighter no matter what time of year it is but there's something about summer that makes me want to cover my whole face in the stuff! I don't but if it were fashionable I totally would. The Anastasia Beverly X Amrezy Highlighter | £29 | Is the most perfect highlighter I've come across in a long time. It gives the cheek bones a lovely sheen that's not over the top but still can be seen. The formula is so butterery, this doesn't even feel like a powder. It translates beautifully onto the face. It is a golden, champagne tone that would be suitable for most skin tones. Why stop at a glowing face? I'm loving adding a glow to my body too. Bronzing body oils are really having a moment in the beauty industry. I've only tried the CYO Bronzing body oil | £7 | But I'm obsessed with this stuff. This does have an oily consistency that blends into the skin so easily. It does give it a bronzed look to it and a beautiful sheen. Once this has been blending in it doesn't feel oily or slippery on the skin. Nor does it transfer on to clothes. I don't think this is water proof so it may not be great for the beach but for anything else this is a summer essential. There are my 5 products for a summer glow.